Solar energy could be turned up a notch not by some exotic material or chip, but surprisingly by viruses. A team at MIT published a paper demonstrating how a genetically modified virus was used in a quantum system to transfer energy at double the speed and over a greater distance than even the best solar cells. Plants are the most efficient energy harvesting mediums, as photosynthesis is able to convert almost all the income energy a plant receives with little waste. It’s no wonder then that a lot of scientists are looking for the holy grail, an artificial leaf of sorts that can mimic this process that took billions of years for evolution to perfect. When a photon hits a receptor inside a plant called a chromophore, an exciton is produced or an electron-hole pair. In other words, an electron gets charged, jumps an energy level and leaves a hole in its absence. When the electron is initially excited it remains strongly bound to the hole since they have opposite charges and are both confined to the same small molecule. Then, this exciton jumps from one chromophore to another until it reaches a reaction center, where that energy is harnessed to build the molecules that support life. Using quantum effects, the exciton can be in multiple places at once. Since its present in multiple pathways at once, the exciton choose the best one (most efficient). Previously, Seth Lloyd, an expert on quantum theory and its potential applications, showed that photosynthetic organisms transmit light energy efficiently because of these quantum effects and the key to their success was just the right spacing between chromophores. Lloyd later met Angela Belcher, an expert on engineering viruses to carry out energy-related tasks, who was working with tiny engineered viruses that happened to have the right wavelength to support quantum effects. The two swapped ideas and eventually teamed up for a project. Four years later, Belcher, Lloyd and dozens of collaborators showed how their engineered virus could bind to multiple synthetic chromophores (organic dyes) at once. They tried out multiple spacing configurations between the synthetic chromophores until they found the right one. Using laser spectroscopy and dynamical modeling, the researchers analyzed the light-harvesting process and found the viruses were indeed transporting energy in a quantum coherence framework. Lloyd says their work could help design a new generation of solar cells. Exciton solar cells (Dye-sensitised solar cells; Organic and hybrid photovoltaics) have been around for a lot of time, but these are clumsy and convert energy at low efficiency. The quantum effect exploiting virus can transfer energy at double the speed of any exciton solar cell. For now, it’s all just a proof of concept though. The researchers have only demonstrated how the virus can be used to transport energy. 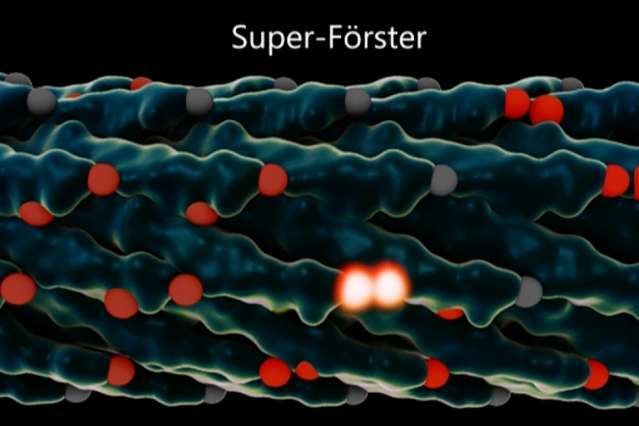 They’ve yet to show how this approach can harness power (electricity) or molecules. Check out the video below for a more in-depth and graphic explanation. Findings reported in Nature Materials.